The respawn timer in MM hud is a thing in SpectatorTournament.res and might only move with a if_match if you don't pin it to anything. The respawn timer in MM hud is a thing in SpectatorTournament.res and might only move with a [i]if_match[/i] if you don't pin it to anything. 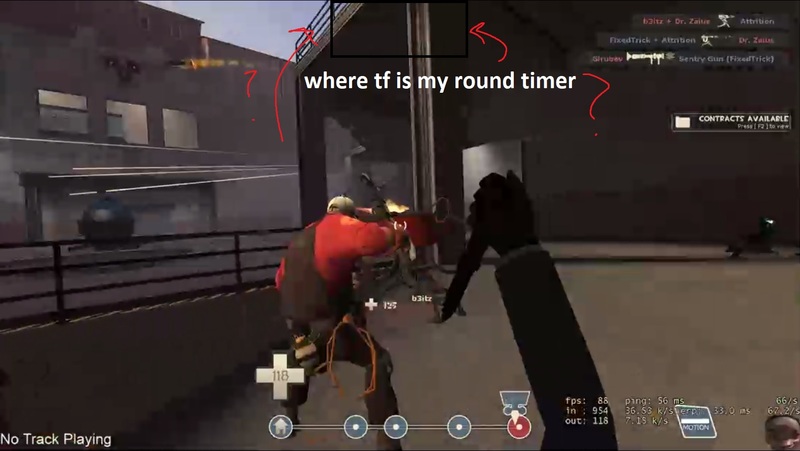 I don't know where my round timer is and when I put in files to try to fix it the timer still won't appear. I currently don't have any file in so wouldn't the round timer default back to normal? Go to clientscheme and change "Low-Ammo Warning 1" and "Low-Ammo Warning 2" to the colours you want. Though it looks like they're already set to red and a lighter red and are set to flash. Add a 'playername' element in the 'playerpanels_kv' (similar to the spectatortournament one) and make sure to add "labelText" "%playername%" in it. Add a 'playername' element in the 'playerpanels_kv' (similar to the spectatortournament one) and make sure to add [i]"labelText" "%playername%"[/i] in it. Wiethoofd Not_HelpfulHow do you do this where the names are showing too. https://imgur.com/a/Y3HhXtn Add a 'playername' element in the 'playerpanels_kv' (similar to the spectatortournament one) and make sure to add "labelText" "%playername%" in it. where do you add this? In HudLayout.res? you've checked hudmatchstatus.res and hubobjectivetimepanel.res, right? https://imgur.com/bZuCzN2 This happens first thing when i start the game up. How do you make this texture not show up? How do i make this orange see-through color go away on r_drawviewmodel 0? Finally, whenever i type hud_reloadscheme into console my scoreboard does not display the data information. https://imgur.com/QJlJNxX This issue only happens when i reload my hud and not on startup. in scoreboard.res what controls the area affecting the scroll wheel. thanks but what .res file is it in? Hello! I want to change my the font of the names of my friends, to TF2 Secondary. Ryder_Pills-1714Hello! I want to change my the font of the names of my friends, to TF2 Secondary. And by this i mean, on the friends list down the items, shop, etc buttons. [quote=Ryder_Pills-1714]Hello! I want to change my the font of the names of my friends, to TF2 Secondary. How would I get rid of this? I don't really pay attention to it and end up just pressing tab most of the time. vanitasHow would I get rid of this? I don't really pay attention to it and end up just pressing tab most of the time. [quote=vanitas]How would I get rid of this? I don't really pay attention to it and end up just pressing tab most of the time. I'm trying to add a second uber percentage under my crosshair, and a second chargemeter underneath the timer at the top of the screen. I've tried just adding them to the hudmediccharge.res, but they won't draw. okay so i messed around with the positions a bunch and it looks like there's some transparent element on top of it that's blocking it, but i don't know how to get rid of it. I've tried setting the zpos really high, but it's not doing anything, and I don't see anything in the hudmediccharge.res that could be doing it. I'm gonna keep looking thru other .res files that it could be, but I'd really love some help! I'm dumb as hell. The layout just had the hudmediccharge,res set really small. I resized it in the layout and got it working, after some tweaks to everything's positioning. Anyone know how I could remove this bar (the gray background of the bar not the whole bar itself)? I assume it's under pvprankpanel.res but I haven't found anything on it. Nevermind I found it! For anyone with a future reference, it's in matchmakingdashboard.res under TopBar > Gradient + BGPanel. Can someone tell me what the event name is for when your target is on low health or buffed? sambalbijCan someone tell me what the event name is for when your target is on low health or buffed? Same event is used for health in any panel, so HudHealthDyingPulse(Stop) controls the low health in targetid & spectator hud and of course HudHealthBonusPulse(Stop) for the buffed state. Same event is used for health in any panel, so [i]HudHealthDyingPulse(Stop)[/i] controls the low health in targetid & spectator hud and of course [i]HudHealthBonusPulse(Stop)[/i] for the buffed state. How would i change the default borders around the health and ammo shapes to black? You would need to take the vtf file itself into paint and recolour it yourself.